Heat oven to 350°F. Sprinkle about 1/4 cup of the flour onto work surface. Cut roll of cookie dough in half; refrigerate one half. Coat both sides of remaining half with flour. Roll out dough to 1/8-inch thickness, using additional flour as needed to prevent sticking. Cut dough with hot air balloon-shaped cookie cutter dipped in flour, or draw a pattern on paper, cut it out and place on dough; cut around pattern with sharp knife. Place cookies 2 inches apart on ungreased cookie sheets. Repeat with remaining flour and half of dough. Bake at 350°F. for 7 to 9 minutes or until edges are light golden brown. Cool 1 minute; remove from cookie sheets. Cool 10 minutes or until completely cooled. In large bowl, combine powdered sugar, corn syrup, almond extract and enough milk for a firm, spreadable glaze consistency; blend until smooth. Divide glaze into 4 small bowls. Color each part with a few drops food color; blend well. 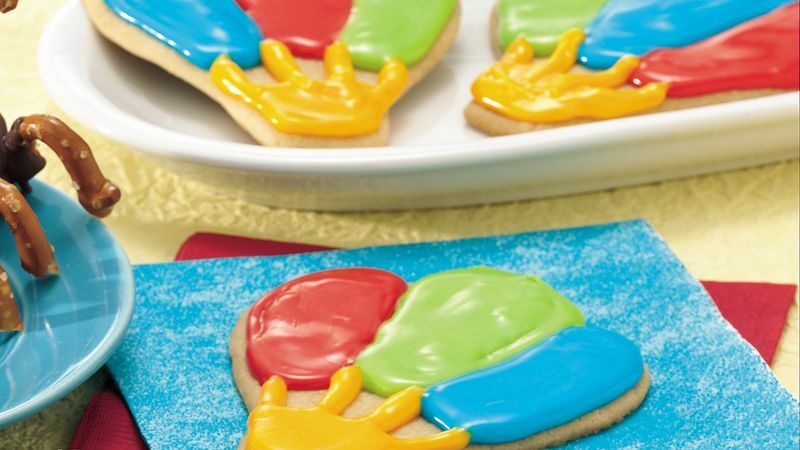 Place each color glaze in pint-sized resealable plastic bag. Cut tiny hole in bottom corner of each bag. To decorate balloon part of each cookie, pipe 1 color at a time onto all cookies, smoothing piped area with tip of bag. Repeat with 2 glaze colors. Use fourth color glaze to make ropes and decorate basket at bottom of each cookie. (See photo.) Let stand about 1 hour or until glaze is set. Store in tightly covered container, separating layers with waxed or parchment paper.